Recently released in Anaesthesia is an article outlining the first eighteen months of eFONA data, authored by airway experts from around the world. Access it for free (read-only) at http://rdcu.be/JtU8. In addition, an accompanying editorial "Big Data: Breaking Ground in Airway Research" by K.B. Greenland and M.G. Irwin was also released. Both are being discussed on a Twitter debate moderated by @Anaes_Journal March 15, 2018 fro 10am-12pm GMT. Click on the article title to read more. What is The Airway App? Healthcare professions frequently download apps to bolster their clinical decision-making. This app is different. We want you to upload your airway experiences. The Airway App allows clinicians to enter their clinical airway experiences 'on the fly' to share them with others. Currently focus is on the high-risk and highly variable procedures of awake intubation and emergency surgical airway/front-of-neck access (FONA). If you have witnessed or performed an awake intubation or emergency surgical airway please share your experience. Evidence about how best to perform these airway interventions are based on case reports and/or smaller case series and expert opinion, usually published in traditional journals. Although clinicians may have valuable experiences unless they write and publish them, this wisdom is 'lost' to a wider audience. Let's change this. Let's capture and share the experiences of clinicians world-wide without relying on publication acceptance. Let's enable data-sharing at a scale that will provide invaluable information about what works, what doesn't, what potentially could cause harm, and what may save a life. Clinical decision-making and airway management are too important and too fraught with error to be left merely to individual trial-and-error, especially when our patients' life or safety may rely on getting it right the first time. The combination of infrequent interventions, siloed specialties, and inconsistent resources can result in approaches that are unproven, ad hoc or idiosyncratic. For example, if a clinician performs a task only twice-annually, it may take years to discover whether it is helpful or harmful, and patients may suffer unnecessarily. 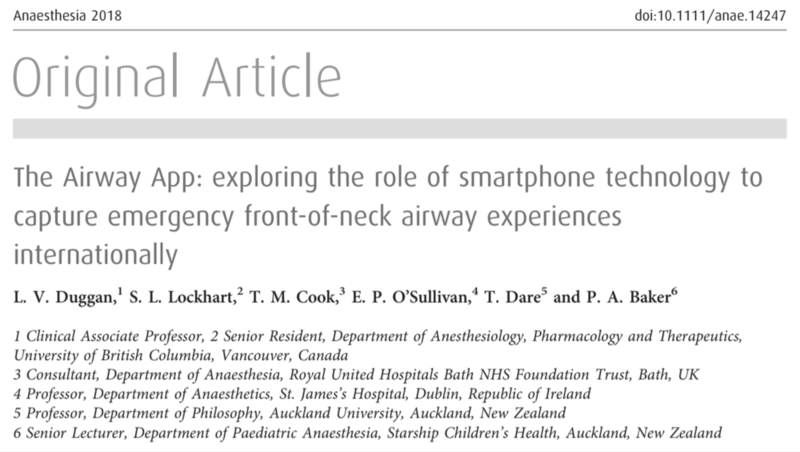 To counter this, we offer a free smart-phone app that captures the benefits of crowd-sourced data, and will focus on awake endotracheal-intubation and surgical airways. These potentially life-saving, but high-risk, interventions deserves a robust and reproducible approach supported by the worldwide experience. What is the International Airway Collaboration? The International Airway Collaboration is an international, multi-disciplinary team of airway experts from anesthesiology, critical care and emergency medicine whose goal is to promote collaboration, symbiotic data-sharing, and patient-safety, and inform future airway education. Our initiative builds upon the National Audit Project 4 on Airway Management from the United Kingdom: which demonstrated the extent of airway errors. Our initiative also builds upon the SHARC research collaborative: which showed how to capture large-volumes of secure-data using a BYOD (bring your own device) approach. We intend to discover the most common pitfalls and collate the best wisdom from around the world. We also hope to engage practitioners who may not previously have had a voice. Download the app to contribute to the knowledge. Follow along on Twitter. RT @drlauraduggan: @LowUpCdnAnesSym @TheAirwayApp And we are in th typesetting phase of our first paper: accepted by @Anaes_Journal Out soon! The Airway App was originally conceived as a result of hearing three anesthesiology residents discussing how awake intubation procedures are both highly variable in method and patient comfort. Although relatively infrequent, we believe learning the best approach to awake intubation procedures should not depend on who happens to teach you. We can discover what best works by crowdsourcing the evidence. The Airway App is designed for any Health Care Practitioner who has performs or witnesses first-hand an awake intubation. Whether you are an intensivist or a medical student, an RN in the emergency department or a paramedic in the field, we invite you to collaborate. If awake intubation is infrequent and a bit anxiety-provoking, the need to perform a surgical airway/front-of-neck access in the 'Can't Intubate Can't Oxygenate' situation is even more so. Performed rarely, time is extremely limited to prevent patient brain damage or death. What is the best option for surgical airway? We can discover what works best by crowdsourcing the evidence. The team behind this project? All of us. “The team behind the project?